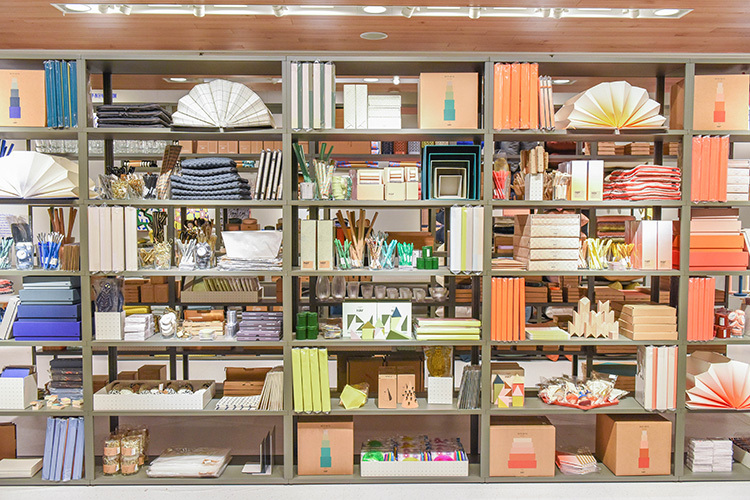 After a stint at the MoMA Design Store, colorful cult-favorite design brand HAY brings its Mini Market to Nordstrom stores across North America. From January 8 through February 7, 2016, HAY will set up shop at seven Nordstrom locations from Virginia to Vancouver, in the latest edition of their HAY Mini Market. The pop-up, which has traveled the globe since 2014, takes inspiration from supermarket shopping with its shelves full of colorful products. Curated by retail maven Olivia Kim, The Pop-In@Nordstrom velkommen HAY Mini Market features a collection of colorful accessories, with prices starting at just $6. Office accessories—scissors, pencils, stationery—feature prominently in the collection, with pieces like these brass scissors. The collection also includes pop-y printed bags with patterns designed by artist and designer Nathalie du Pasquier. For those with New Year's resolutions in mind, the shop offers a range of materials for organizing, like the Pinorama wall board. At $250, the large size is the most expensive item in the collection.